The past few years, Hackney Wick has transformed from a peripheral derelict industrial area into a new creative urban centre. Located on the fringe of the Olympic park, Hackney Wick underwent a particularly rapid change since the Olympic mega-project of London 2012 was initiated. The regeneration of East London was part of the master plan for London’s 2012 Olympic and Paralympic Games. It thus seems likely that Olympic-led redevelopment in East London impacted the land use and value, the accessibility and the symbolic value of Hackney Wick. Developments in Hackney Wick can be seen as a part of a process of gentrification, which has sped up since London 2012 was planned at its doorstep. It has to however be questioned what exactly the effect of the mega-event Olympics 2012 has been on the process of gentrification in the area. The role of wider structural economic changes, such as the transition from an industrial to a post-industrial society, cannot be ignored. Currently the dynamics of the cognitive cultural economy, revolving around intellectual capital, digital technologies and cultural industries, play a significant role in many global cities. Therefore, when analysing gentrification it is relevant to take into account these structural changes as well as neoliberal policymaking and the local context. The Olympics London 2012 was a mega-event in which contesting claims on urban space had to be negotiated. On the one hand it has been embraced as overall stimulator of the global competitiveness of London, attractor of global investments to the area and catalyst of urban regeneration of in particular East London. On the other hand, it has brought in its wake the fears generally held by communities when ‘invaded’ by large-scale projects or events, such as displacement and the loss of the existing character of the place. So how did the planning of the Olympics affect the regeneration and gentrification of East London’s Lower Lea Valley, and in particular the neighbourhood Hackney Wick? 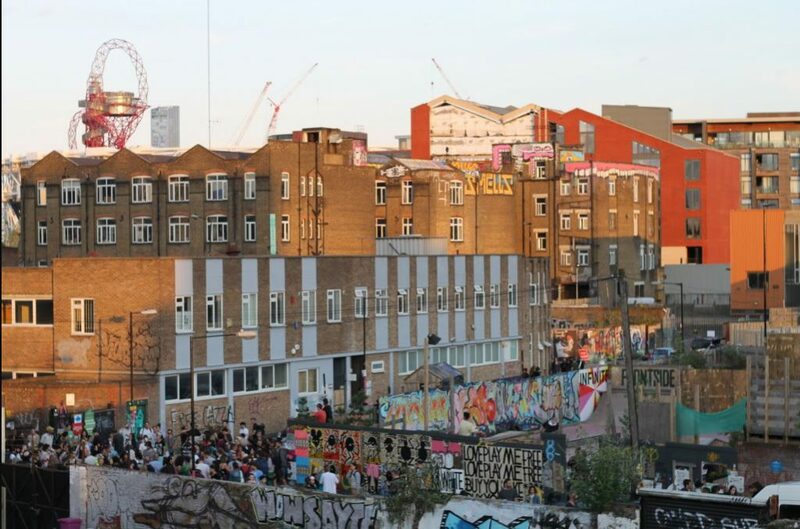 This article looks at the changes in focus of the redevelopment strategy pre- and post-Olympics 2012 planning, mainly discussing the role of connectivity, land use and value, and changes in the symbolic value of Hackney Wick. Hackney Wick is located in the Lower Lea Valley, an area with an industrial and infrastructural past that used to be on the fringe of London. The river valley hosts an engineered landscape of canals, railways and separate urban islands and has been characterised by derelict spaces since industrial decline took place. 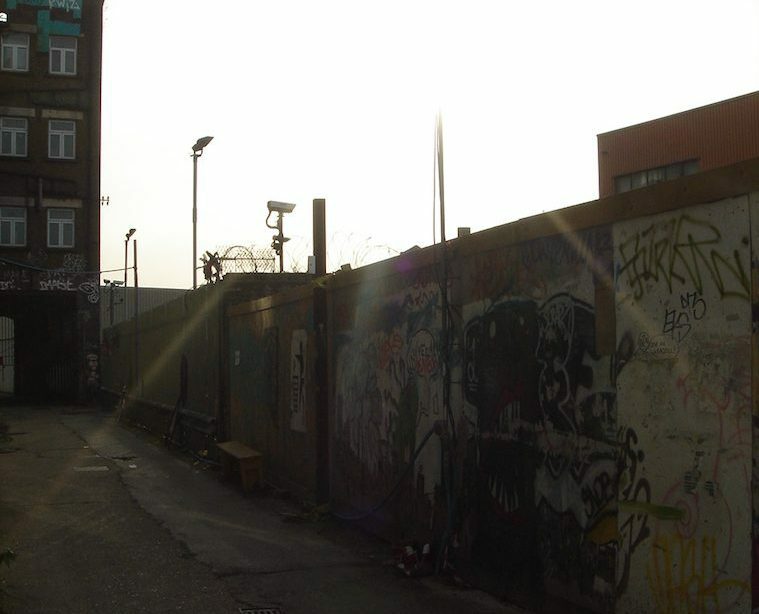 Hackney Wick was one of these urban sites that had an “island nature and forgotten feel” (Tomlinson 2012), due to its limited connectivity with the rest of London. Already before London won the Olympics bid in 2000, new public transport infrastructure was constructed that would improve the accessibility of the Lower Lea Valley. The Jubilee line came into functioning in 1999 and in 2009 a new high speed line started running. The regeneration of the area in terms of an improved accessibility and a corresponding rise in land values is thus not exclusively attributable to the Olympic-led development. Improving the infrastructure in this area however was also an important part of the Olympic Fringe Delivery Strategy. The accessibility of Hackney Wick via a new Overground station and the development of a hub of commercial activity around the station have been extra stimulated by the Hackney Council and the London Thames Gateway Development Corporation. Street improvements and new bridges from the fringe area to the Olympic Park have been created to improve the connectivity of the area and to encourage the local economy. The Olympic-led development has definitely accelerated the process of opening up the area to ‘outsiders’. Characteristic features of Hackney Wick’s land use are its industrial buildings and infrastructure, remnants of its manufacturing past. With the transition from an industrial to a post-industrial society, many industrial units became vacant and from the 1980s onwards were occupied increasingly by galleries and studios, and small ‘light’ industries. The low studio rents and unregulated landscape provided spaces for artists to experiment, engage in critical art practices and form networks of collaboration. The public space was under-designed, leaving many blank, open spaces without obvious function, so-called urban voids. Artists were attracted by the urban voids and the freedom they experienced in this under-determined environment (Fior, 2012). This feature of Hackney Wick has greatly changed due to the Olympic-led development. The amount of regulation in the area has increased, so much according to critics of the Olympic project, that it has been transformed into “one of the most highly regulated landscapes possible” (The Militant City, 2012). Due to the area’s historical function as manufacturing site there is also a low residential density. This meant that there was, until recently, little commercial activity and weekday traffic. Researchers who have mapped the area, strikingly describe Hackney Wick as “a factory town, a mixed-use neighbourhood with few civic amenities and almost no ‘public spaces” (Fior, p.118). However, as the mixed-use development present in Hackney Wick was not the type desired by the Olympic Park Legacy Company, the Olympic park development has triggered a transformation in the land use. In 2000 there were, in the whole of the Lea Valley, 254 diverse industries and businesses. These were for example waste recycling industries, glass assemblers and metal distributors. In the redevelopment plans for the Olympic site, these businesses and services were all defined as “past uses”. Whilst previous regeneration plans emphasised the needs of the local community and businesses, the planning of the Olympics in East London shifted focus to a physical regeneration that would benefit this global event. The central ambition in the transformation of post-industrial East London was to be creating an economically competitive area that is visually compatible with the image of a redeveloped landscape. Businesses that were regarded “either of low economic value for London and or not suited to integration within mixed-use development” (Davis and Thornley, 2010, p. 93) were relocated, thus leading to a dispersal of the economic activities which were present in the area. Other pre-Olympic occupants, among whom especially artists as they do not have the economic capital to afford stable housing, have been out-priced as a consequence of the rise of land value. The increased investments in the real estate of the area are for a large part a consequence of the area’s proximity to the Olympic park. The regeneration process stimulates housing development projects and retail amenities that cater to the middle class. There is thus a shift from a ‘working’ and producing Hackney Wick to a more middle-class residential area focused on consumption practices. As the London Development Agency declared in 2004, the Olympic games and the planning of its legacy were inextricably bound to the “sustainable mixed-use regeneration of the Lower Lea valley” (Davis and Thornley, 2010, p. 92). Thus, even though plans to regenerate the deprived and rather dilapidated Lower Lea Valley were already made and being implemented before London won the bid to host the mega-event Olympics 2012, the planning of the Olympics definitely gave a different dimension to the regeneration of the area. The mega-event driven development especially had an impact on the focus of the redevelopment and on the decision-making process. The redevelopment of the area as planned by the Olympic Delivery Authority was driven by market forces. The attraction of private investment was central to improving the competitiveness of the area. The difficulty of raising public resources due to the global crisis of 2008 led to a diminishing development of low cost housing and social housing. The planning of the Olympics did not entail a private sector take-over, but public-private partnerships played a significant role; as the urban scholar Smith, who has researched the London 2012 Regeneration Planning, states that it involved “an extension of public actors’ responsibilities into entrepreneurial activity” (Smith, 2013). Another aspect of the regeneration which proves the effect of the mega-event is the shift of focus toward achieving a global legacy instead of meeting local needs. The global publicity and time pressure influenced the decision-making process with regard to how the regeneration should be organised. There was less room for public engagement due to the more ends driven character of the regeneration. Community members with land on the Olympic site did get the room to negotiate over their compensation and the sites they would be relocated to, however community participation was very limited and relocation itself ordered from top-down instead of democratically decided. Especially for small businesses and residents the rising prices of land was problematic. Obviously, the effect of the Olympics is evaluated differently by different stakeholders. The large-scale investments which were attracted created additional resources for the redevelopment of the area and thus were welcomed by larger businesses. The artistic community of Hackney Wick has significantly shaped the character of the neighbourhood the past decades. Locals currently fear that the unique spaces of Hackney Wick, which offer freedom for artists to experiment and to collaborate and form networks with local industries and the possibility to live in the area due its affordable rents, will soon disappear. The increased accessibility of the area, together with growing commercial activity, draws in tourists and new middle-class residents. A change in land-use and value of property, means that residents with little economic capital will have to leave. Successively, and also due to stricter regulations and the erasure of urban voids, the character of the area changes. The rise in land value due to real estate investments, redevelopment of public spaces, increased accessibility, commercial activity and change of symbolic value point towards a gentrification of Hackney Wick. Whilst artists who have been working and residing in Hackney Wick for years lament the transformation of an area once known for its rawness and freedom, it has to be noted that they can be regarded themselves as “the first cog within a chain of gentrification” (Weber-Newth) As an artist expressed strikingly during a discussion about the transformation of Hackney Wick: “We are gentrifiers, I know I am. I’ve done it three times, I’ve ruined various areas! I was in Notting Hill in the 60s, in Shoreditch in the 80s, and now in Hackney Wick” (qtd. in Weber-Newth). Therefore, the transformation and gentrification of Hackney Wick should also be explained as part of an ongoing process of gentrification linked to the structural change of the economy from an industrial economy to the cognitive cultural economy. The Olympics have mostly accelerated the symbolic repositioning of Hackney Wick from a fringe area to a ‘new creative’ urban centre. Exemplary of Hackney Wick’s new image as global creative hub is the arts festival Hackney WickED. When first held in 2008 it was a small festival mainly showcasing the work of local artists, but in 2011 already the festival “nearly burst at the seams, with the streets of The Wick flooded with a constant stream of people coming off the buses and overground”, according to the festival’s website. Mega-event planning Olympics 2012 and gentrification in Hackney Wick: two sides of the same coin? 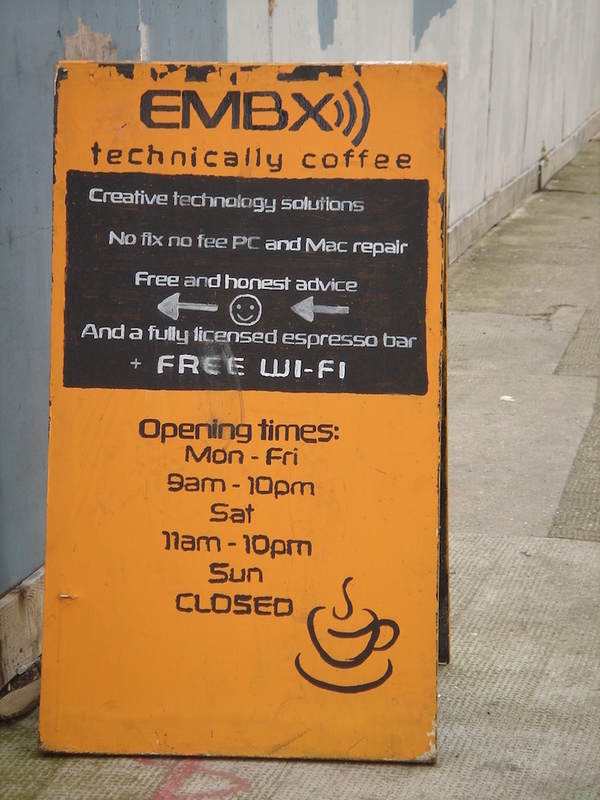 Mega-events such as the Olympics 2012 and gentrification are both part of neoliberal urban policies and the advance of the cognitive cultural economy. On the one hand entrepreneurial urban governance accelerates gentrification processes, but on the other hand gentrification was already taking place due to structural changes in the economy and infrastructural improvements in the area. Therefore, it is difficult to determine in what way exactly the Olympics 2012 effected the process of gentrification in Hackney Wick. The Olympics have mainly sped up the regeneration process and made the decision-making process less democratic, more focused on efficiency, market forces and the global legacy instead of local community needs. The neoliberal focus on profit-seeking spurs the rise of land value and thus the displacement of tenants, and the new symbolic image of Hackney Wick as a creative hub. From petrol refining to showcasing arts: Hackney Wick has turned Hackney WickED. — Davis, J. And Thornley, A. (2010), Urban Regeneration for the London 2012 Olympics: Issues of Land Acquisition and legacy. In: City, Culture and Society Vol. 1: pp.89-98. — Fior, Liza (2012), Observation is Proposition: Mapping in Hackney Wick and Fish Island. In: Architectural Design Vol. 82 (4): pp.118-121. — Tomlinson, Steven (2012), Centring on the Olympic Fringe. In: Architectural Design Vol. 82 (1): pp. 103-107.
with as thesis project a research into the socio-ecological impact of new metro connections, comparing neighbourhood effects in Hong Kong and Amsterdam. Currently she works in Public Relations and Research at Rem Koolhaas’ architecture practice O.M.A in Rotterdam.